Ghanaian striker, Emmanuel Boateng is on the verge of completing his move to the Chinese Super League before the Chinese transfer window shuts down on 28th February. Levante is demanding within the margin of $16m from Chinese outfit, Dalian Yifang, before they agree to sell him out. The transfer speculations were fueled when Boateng was left out of Levante’s trip to Deportivo Alaves. Boateng signed for Levante last season and rose quickly to become a household name among the Levante faithfuls when he scored a hat trick against La Liga giants Barcelona. 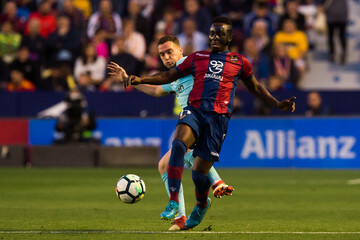 The Ghanaian has failed to impress this season after he scored just a goal in 19 appearances for Levante. Boateng has fallen out in perking order to the likes of Raphael Dwanema, Jose Moales, Borja Mayoral and Roger Marti. The move will enable Boateng have more playing time and get the chance to be selected by Black Stars gaffer, Kwesi Appiah, for the upcoming African Cup of Nations in June. Boateng, 22, made his Black Stars appearance last year.